15 x 14 x 12 cm. The crystal here is VERY GLASSY and has a high color saturation for an aqua from Shengus. It measures 9 x 3.5 x 3 cm in size and rises majestically from the matrix. 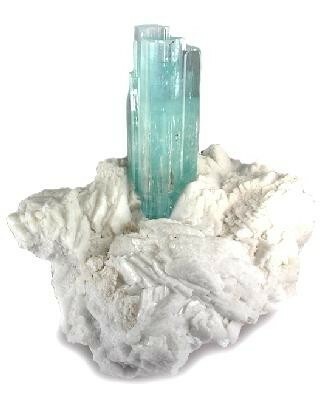 It presents as a dramatic specimen because the 9-cm-tall aqua is perched on CRYSTALLIZED matrix, for startling contrast not just in color but in crystal form as well.